The solution: put the streetcars under the street! In the mid-1890s, construction began on the Tremont Street Subway, the first of its kind in America. The Subway under construction in the mid-1890s. The construction plus all of the streetcar and wagon traffic must have resulted in extreme congestion! On September 1st, 1897, the Tremont Street Subway opened to much fanfare. Headlines on display at Park Street Station today proclaiming the subway's success. Park Street Station as it looked in 1897. Construction was completed in merely two years, extremely fast even by today's standards. As the headline "First Car Off the Earth," shown in the photograph above, suggests, people were wary of the dark underground tunnels at first as subterranean and dark places had always been negatively associated with evil spirits and other superstitions. Almost immediately, though, people's fears gave way to awe of the Subway's convenience and engineering notoriety, feelings already expressed in the initial headlines above. Even so, to ease people's initial quibbles, the subway was initially whitewashed and brightly lit with electric lights. When it opened, the Tremont Street Subway was a very busy place. 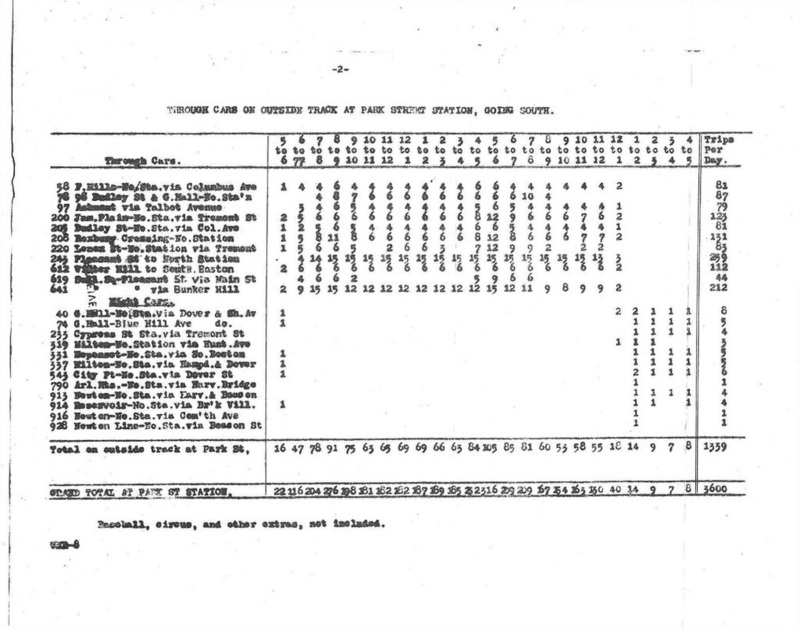 In contrast to the four lines that use the subway today, about forty lines still ran through Park Street Station in 1911! 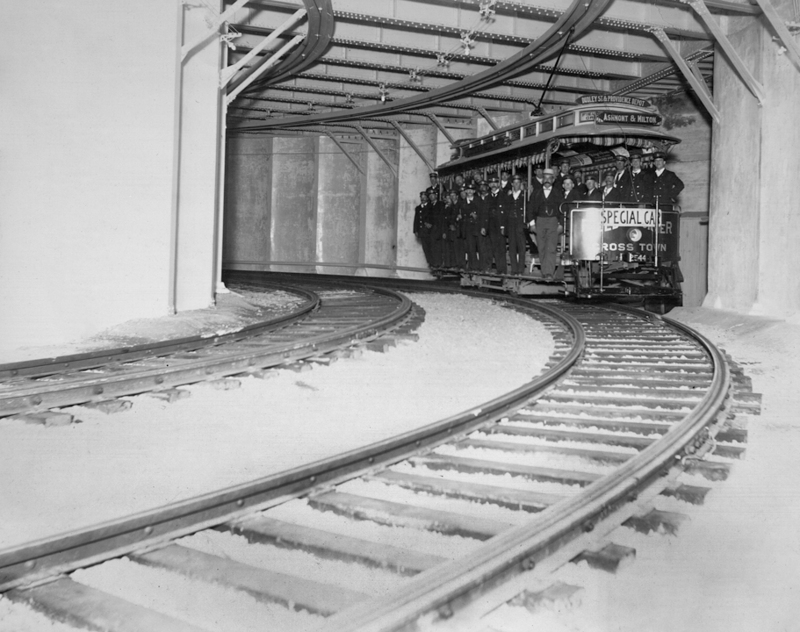 Even more lines ran through the subway in 1897. When the Washington Street Elevated entered service in 1901, many of these lines were cut back to Dudley Station so as to ease street traffic and provide riders with a quicker trip downtown via a transfer to the El. With the advent of mass-produced automobiles in the late 1900s, the construction of the subway and the El was well-timed. 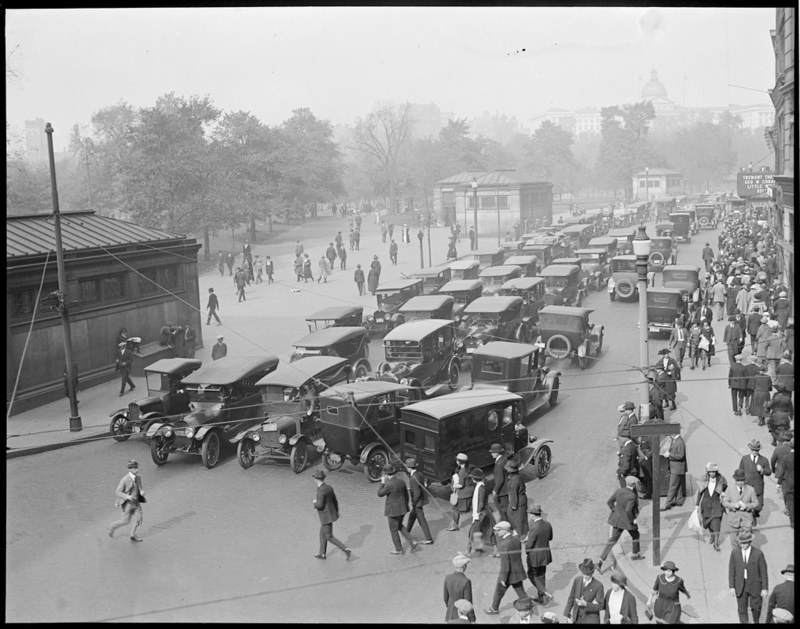 By the early 1920s, downtown Boston was packed with automobile traffic. 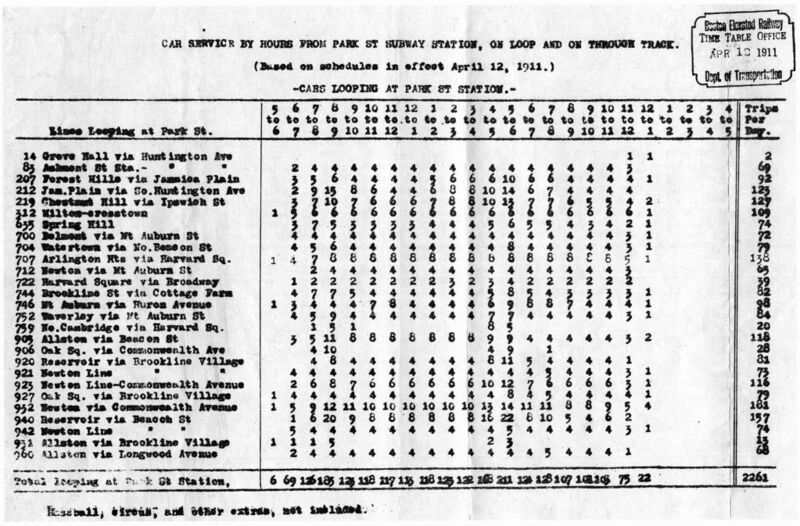 Additional streetcars stopping on Tremont Street, Boylston Street and other downtown streets near the subway would have caused extreme congestion, and with these roads so integral to car traffic it would have been much harder to construct a subway in the area, particularly under the roads, than it was in the later 1890s, when there were very few cars. The added traffic would have likely resulted in a construction timeline of much more than the two years it took to build the subway, and the traffic delays would have been a nightmare! Tremont Street by its intersection with Boylston Street in the early 1920s. On the left of Tremont Street are the headhouses for Boylston Station, the first station in the original Tremont Street Subway along with Park Street Station. As you can see in comparison to the earlier photographs of pre-subway Tremont Street, car traffic on Boylston Street has increased significantly since the 1890s, though there is no streetcar traffic as the streetcars are all underground in the subway. Imagine the acongestion that would have been caused if the streetcars were still there! Note the remaining trolley pole and trolley wire on the left of the photograph. Even in the 1920s there were trolley remnants! As one might imagine, safety standards were very different in the subway in 1897, a fact still evident in the subway's construction today. The photograph above is of a test run of the subway shortly before its opening. Initially, many open-walled streetcars such as these ran through the tunnels with people hanging off them! As one might imagine, there were multiple accidents with people falling off of the cars or bumping the side of the tunnel. 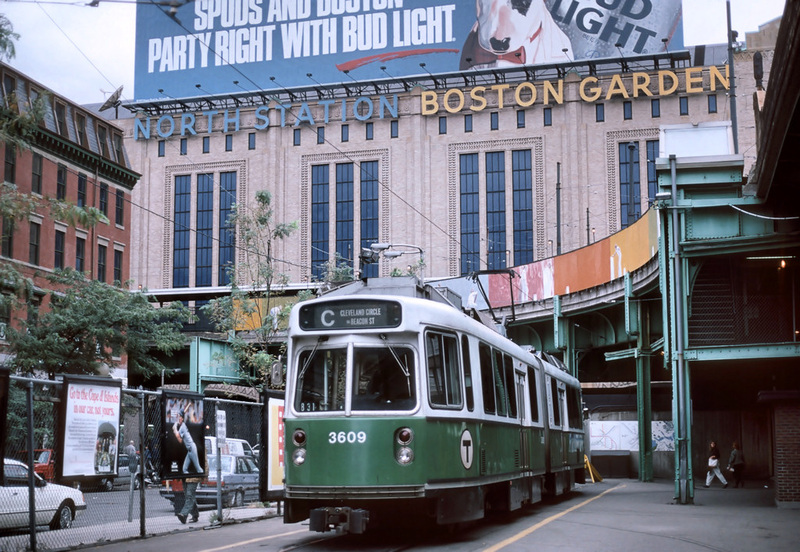 Streetcars initially entered the subway through the now-sealed Public Garden Portal and stopped at Boylston Station before stopping and looping at Park Street; imaging holding onto an open streetcar when rounding the sharp curve approaching Boylston from Arlington! The curve was just as sharp in 1897, and it must have been quite the challenge to do so! The maintenance procedure in the subway was not any safer. See those gaps in the wall in the photo above? Those were for maintenance workers to duck into in case trolleys came by while they were working on the tracks. Because there were no shuttle buses back then, streetcars had to run at all times, and if maintenance had to be done it had to be done right away during revenue service hours. At least the gaps were closely spaced. Since they were all built before buses were proven to be reliable above-ground substitute transportation, all of the Green Line subway's tunnels have similar gaps, though the gaps in the tunnels closer to Kenmore are slightly further spaced. In contrast, the Silver Line's South Boston Transit Way, which opened in 2004, has many fewer gaps still constructed just in case. The section of the Tremont Street Subway from Boylston to Park Street was the first in a series of streetcar subway constructions in Boston. Only a month later, a second branch of the subway continuing south down Tremont Street to what is now Eliot Norton Park opened for southern streetcars to feed into. 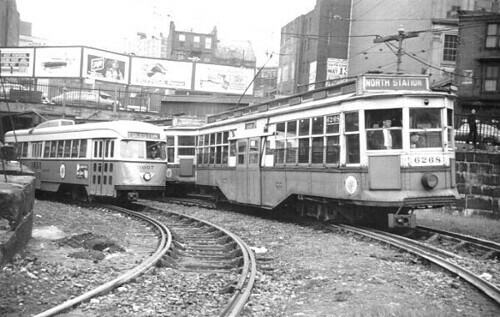 Though the last streetcars to used this subway stopped running in 1962, the subway still exists today and is clearly visible at Boylston Station where it branched off of the main subway, similar to how the E Line branches off at Copley though not identical as this subway had its own platform. 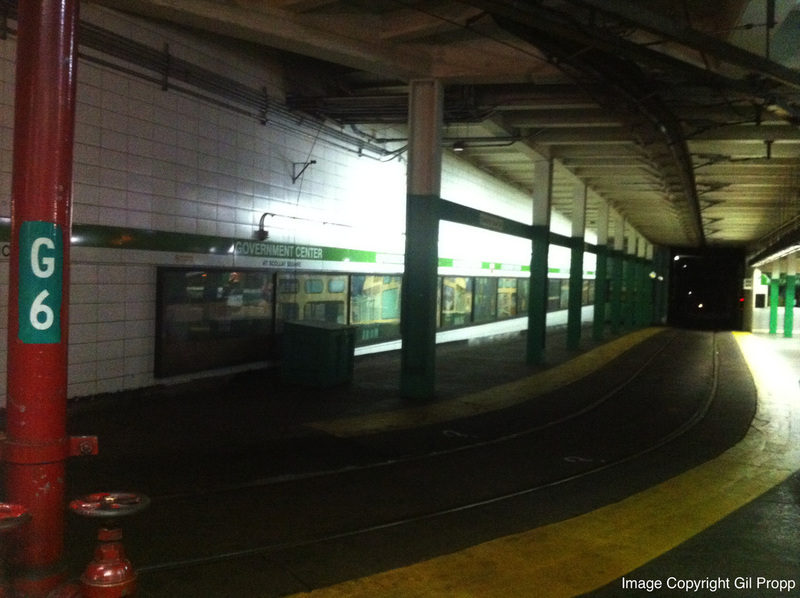 Today, the closed subway platform serves as storage space for MBTA vehicles., and the rest of the platform is abandoned. The Pleasant Street Portal, the entrance to the abandoned tunnel. Eliot Norton Park sits above this entrance, which has been sealed and covered. PCC on left is headed south to Egleston Station in Roxbury. Originally, streetcars using the subway could not continue underground past Park Street. To return above ground, streetcars would loop at Park Street and come back through Boylston to emerge through the Public Garden Portal and onto the streets of Boston. This changed in 1898, a year after the subway's opening, when the subway was extended north to the Canal Street Incline in the West End, near where North Station is today. Now, streetcars could enter and exit the subway at a second location and serve three locations, Scollay and Adams Square stations (predecessors to today's Government Center) and Haymarket Square station, completely underground without causing traffic congestion. The photo above, taken in the late 1980s, shows the Canal Street surface loop station which has since been redeveloped into the apartments you saw above. Streetcars entered the loop from Causeway Street and continued into the subway, or looped at Canal Street to re-enter the subway for outbound service. The last line to use this loop regularly was the C Line, which looped at Canal Street to continue back to Cleveland Circle in Brookline. This 1946 US Geological Survey map of Boston shows that the Canal Street Incline (where streetcars re-entered the subway) was located by Canal Street just after what is now Valenti Way. The gap between the buildings you see below, now occupied by a parking lot, is where the incline was once located. The odd concrete under the red bricks on the building on the right of the view is presumably what made up the incline. 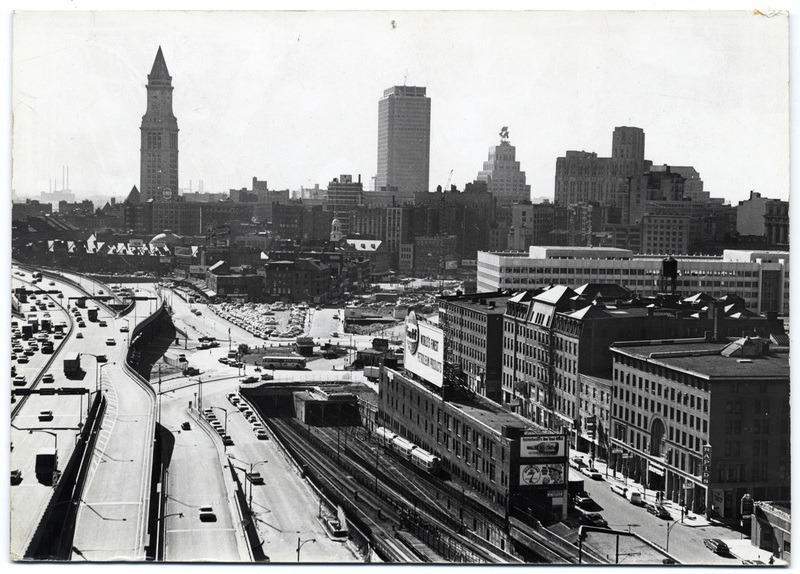 Update: Check out the mid-1960s photo, posted below, that I found via City of Boston Archives! Compare to the street view above, and you'll see that the photo clearly shows that the Canal Street Incline was located exactly where I thought it was! The building shown at the right of the incline in the photo below is still there today, as confirmed by the street view. The building on the left in the street view appears to have been constructed following the demolition of the Charlestown Elevated, which used the left part of the incline, in 1975. The triple-grated building in the center of the street view, as seen in the photo below, was the streetcar incline! The grates are undoubtedly covering the triple-arched structure into which the streetcars descended shown in the photo below! With that in mind, the similarity of the original triple-arched structure to the old surface Massachusetts Station is logical yet striking nonetheless! The Causeway Street Elevated and Canal Street Loop on the site of the present-day apartment complex in the 1930s. 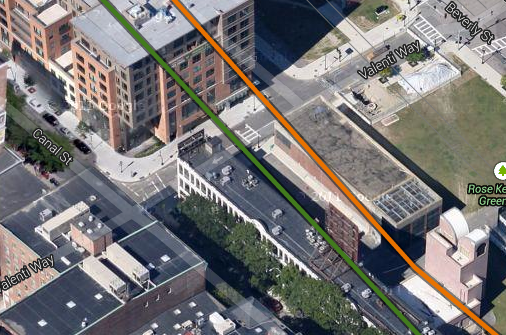 The other El on the right is the old Main/Orange Line Charlestown Elevated, which met the Green Line at North Station as the present-day Orange Line does.. The last two trolley routes to enter the subway at the Canal Street Incline were the 92 and 93 from Charlestown, which were converted to buses in the late 1940s. The trolleys would loop at the Brattle Loop between Adams and Scollay stations and then return to Canal Street and continue back to Charlestown. Remnant of Brattle Loop at Government Center in 2013. Today the loop seldom sees service, unless there are delays beyond Government Center, and the main usage of the loop is to store out-of-service streetcars. Government Center is built primarily out of the former Scollay Square station, Adams Square station has been integrated into the basement of Boston City Hall. No further extensions of the subway were built until 1912, when the Causeway Street Elevated and Lechmere Viaduct opened to extend the subway to Lechmere in East Cambridge. While the Elevated and Viaduct were not underground, they were still central right-of-ways that extended that subway and were to be used by multiple streetcar lines. Initially, the Elevated and Viaduct were used to channel multiple streetcar lines from the Somerville vicinity, which already entered the subway at Canal Street, directly to the subway. However, this practice was terminated in 1922 with the construction of the Lechmere terminal. Now, Somerville's streetcars looped at Lechmere, where one could transfer to another streetcar that would take one to the subway. 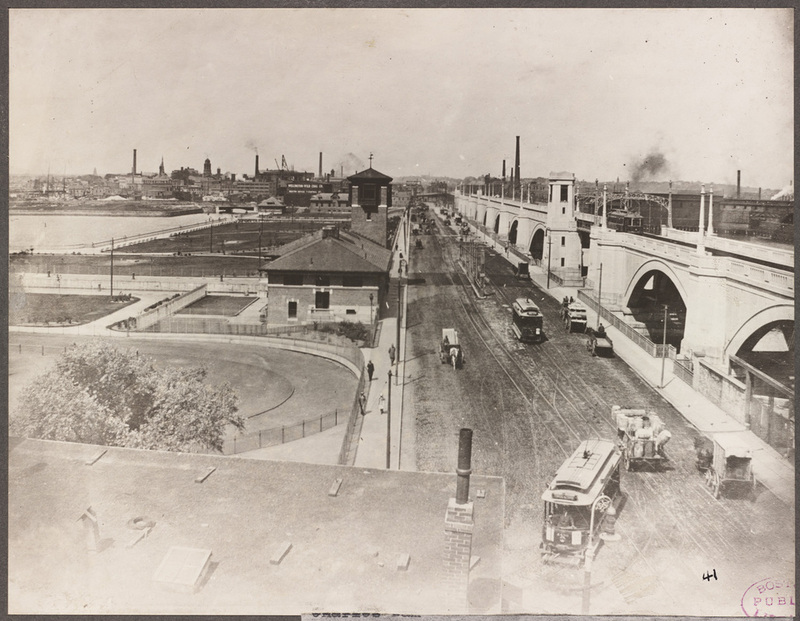 Charles River Dam and Lechmere Viaduct in the 1910s. Some streetcars from the Somerville vicinity continued to use the street-running tracks to cross over to the West End and Canal Street. Note that the Museum of Science had not yet been constructed on the Charles River Dam. With the construction of the Elevated and Viaduct, two new stations, the elevated North Station in 1912 and Lechmere in 1922, opened along the subway. Following the opening of the Boston Museum of Science on the Charles River Dam in 1951, the MTA constructed Science Park Station at the point of transition from the Viaduct to the Elevated. The Causeway Street Elevated stayed in service until 2004, when it was torn down, by which time it was the last elevated train structure in Boston other than the Lechmere Viaduct, which is still in service today. Another subway extension was constructed in 1914, this time extending westward. With this extension, the present-day Copley and Hynes Convention Center (then called Massachusetts) stations were added to the subway. Instead of trekking through downtown, western streetcars could now enter the subway at Kenmore Square through the Kenmore Portal and continue to the Tremont Street Subway completely underground. With this 1914 extension, the Public Garden Portal through which streetcars had entered the subway was sealed and relocated to the center of Boylston Street. 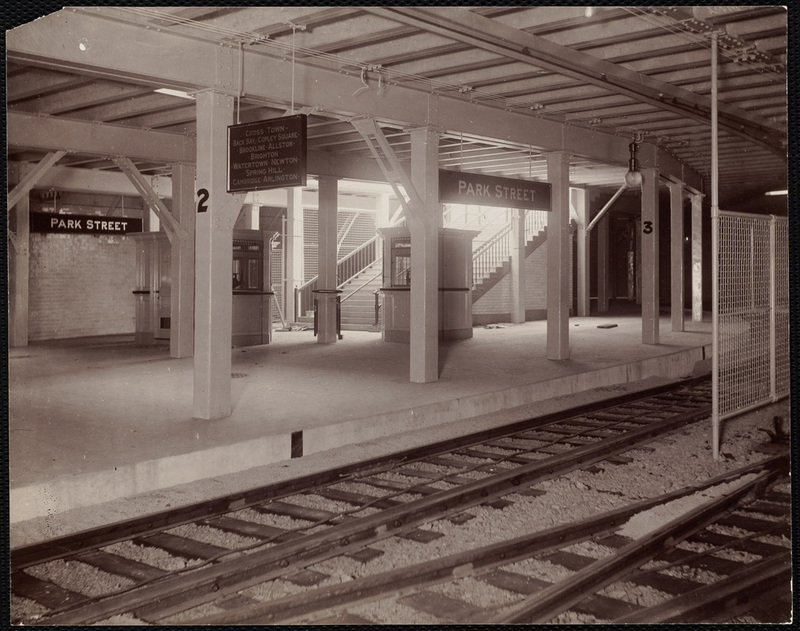 The new portal, renamed the Boylston Street Portal, would serve as a third subway entrance (in addition to the Pleasant Street and Kenmore Portals) for those lines that still ran through the streets of downtown, in particular the Arborway Line (predecessor to the modern E Line). 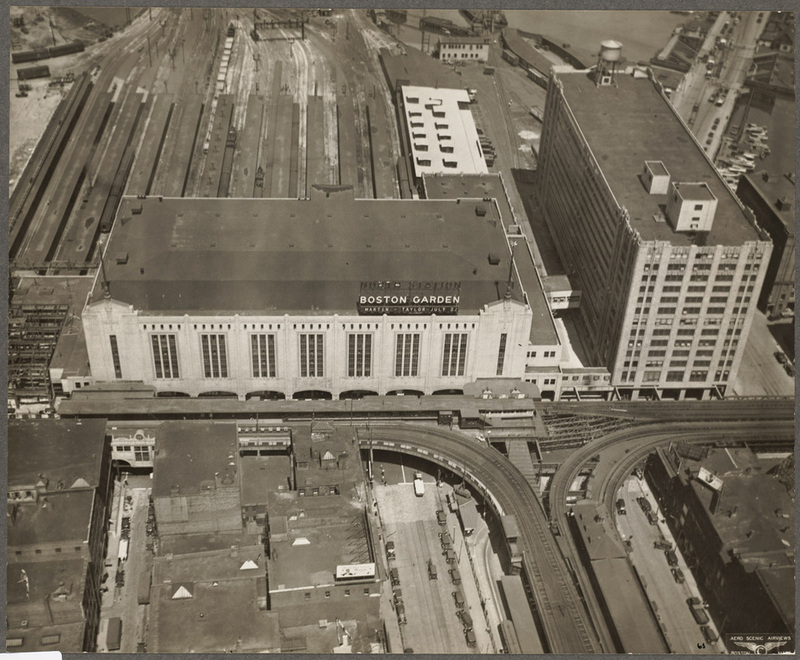 Other than the addition of the underground Arlington Station between Boylston and Copley stations in 1921, no more significant changes were made to the subway until 1932, when Kenmore Station was moved underground. With the construction of the Kenmore subway station, streetcars no longer ran through Kenmore Square on street level and the Kenmore Portal was subsequently sealed. The surface streetcar station was later repurposed into the bus station it is today. Nine years later, in 1941, the Huntington Avenue Subway, an exclusive underground passage for the 39 streetcar (later the E Branch of the Green Line), was constructed (See "E Branch" article for more details). 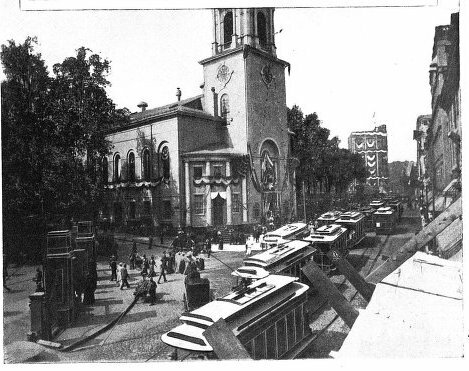 With the 39's move underground, scenes such as the following of streetcars passing the Boston Public Library, Trinity Church and other Copley Square landmarks promptly came to an end. The 39's move also meant the end of streetcars entering the subway in the area around Park Square. The 39 had been the last streetcar to run through Copley Square and along Boylston Street, and accordingly the last streetcar to enter the subway through the Boylston Street Portal. Therefore, after the opening of the Huntington Avenue Subway, the Boylston Street Portal was sealed for good. The wide underground area in the subway where streetcars from the Portal entered the subway remains to this day. Riding a streetcar between Arlington and Boylston Stations, one can still clearly see the wide area, which today is used to store out-of-service cars. There is even a remnant of the Public Garden Portal in this area. On the right side of a westbound streetcar (or vice versa), look out your window and you'll see that the tunnel continues slightly to the right; the tunnel that carried streetcars to and from the Public Garden Portal remains to this day! On the left, if you look very closely you'll see another tunnel branching off of the main subway; this is the beginning of a never-constructed tunnel that would have taken streetcars to Post Office Square undergound and intersected the subway at what was then its beginning, the wide area between Arlington and Boylston Stations.